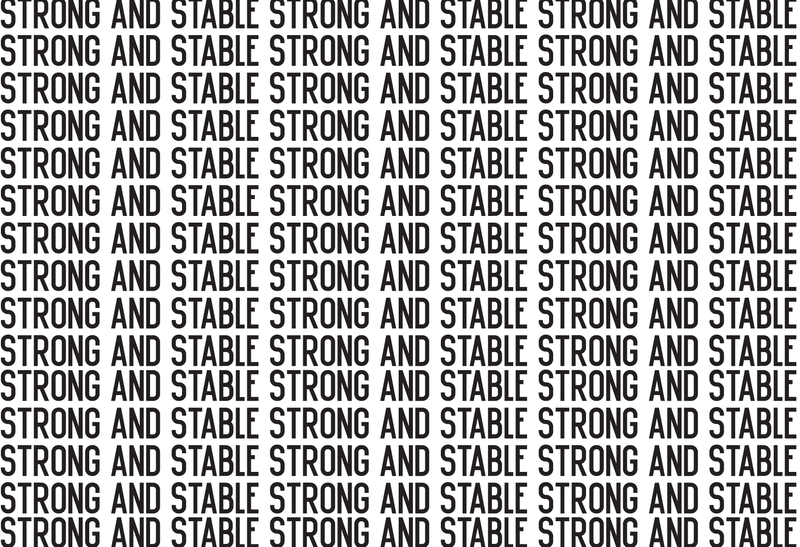 or his latest project, in the lead-up to the UK’s general election, graphic designer Rob Lowe, aka Supermundane, has released a series of posters that are free to download. He is encouraging us to print them out and “put where people can see them”. Here, he writes about why he’s returned to posters and how they might have the power to break us out of our bubbles. 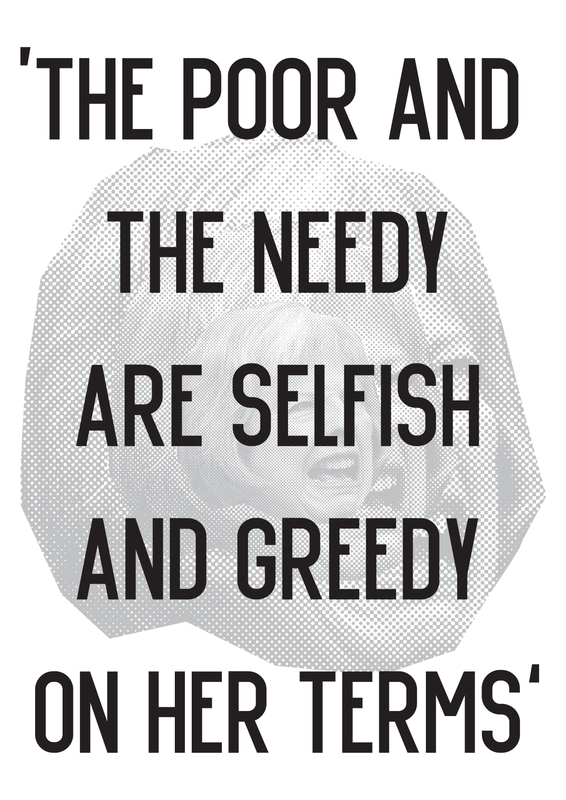 "I decided to make these posters while on the Eurostar heading, ironically, for Brussels" writes Rob Lowe of his latest political action through inspirational type and lines. 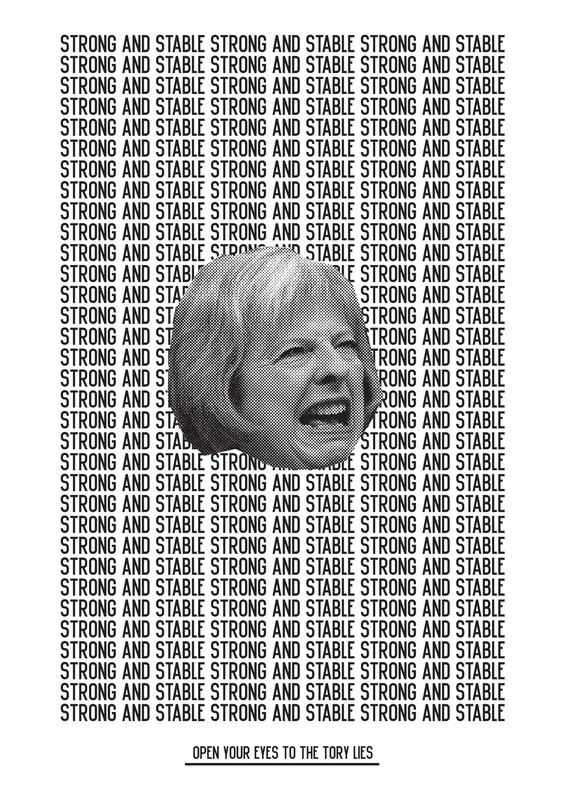 A call for action in graphic ways Supermundane's posters need to get the conservatism out of the way before UK's, very important and vital, general elections. "I had been reading interviews with the French activist/communist design group Grapus and it inspired me to return to an idea I had a few years ago. I wanted to design posters for the last general election but the mood was very different back then – it was only a couple of years ago that nobody really spoke about politics – and I felt that printed posters were maybe a nostalgic indulgence in the age of social media. I grew up in the 70s and 80s with the looming threat of nuclear war and TV shows like Spitting Image and The Young Ones that brought politics to the youth. I was interested in the cartoons of people like Martin Rowson and Gerald Scafe and I would copy the grotesque drawings of Maggie Thatcher and other politicians. Then the 90s came along and the rise of individualism and people lost interest in organised politics. Apart from a few spikes (the anti war march of 2003 and the riots of 2011 for example) politically this country has been gripped by a mass apathy that we have only recently been shaken out of. I have been thinking for a while now that a return of the printed poster in public common spaces could be a way of breaking out of the social bubbles we all find ourselves in. 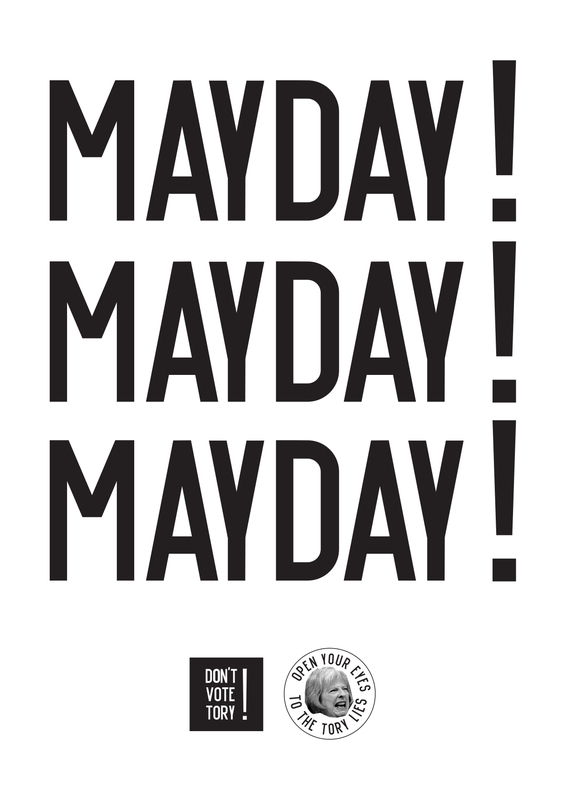 The posters themselves are simple, using my own typeface, Mundane Condensed, black and white for easy copying and free for anyone to download. 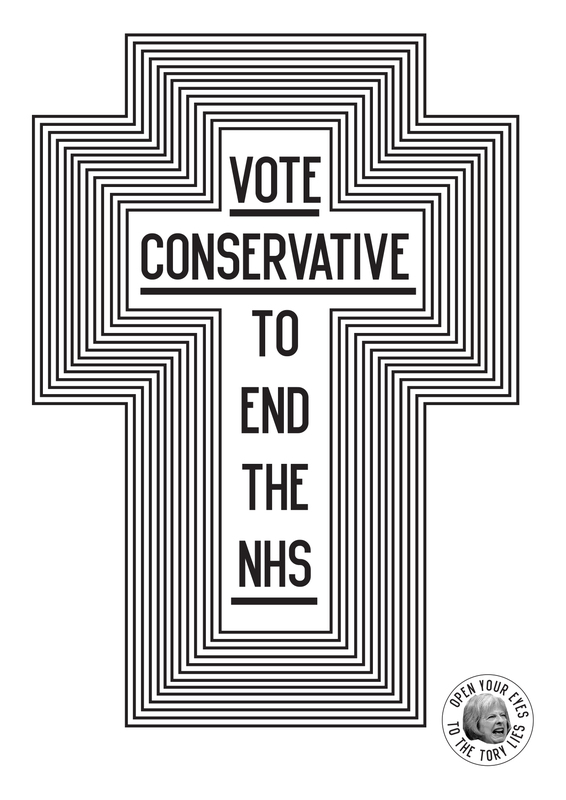 Most of the slogans are mine (it was a gift when I wrote out ‘Vote Conservative to end the NHS’ and it made a cross) but one of the posters uses Morrisey's lyrics. My feeling is they work best in multiple, a whole wall of the eyes would be very effective. These are not aimed at older Tory voters but younger people, something to get people thinking and talking. If anyone doesn’t like them or think they are ineffective then that’s fine; to that I would say make your own and get your own message out there. Talking about these posters isn’t the point, getting the Tories out is". 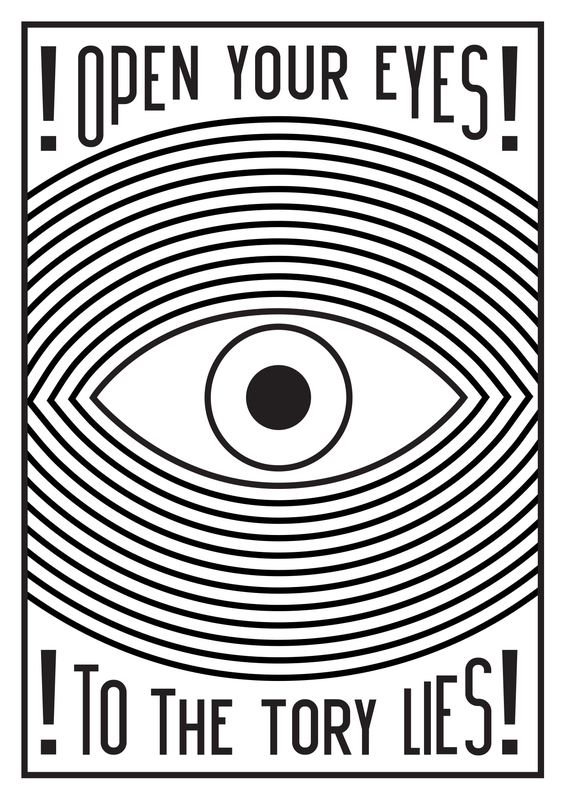 Supermundane's posters are free to download and are a shareable activism made by graphic design mastery. FYI. The United Kingdom general election of 2017 is scheduled to take place on 8 June 2017.